Now available in paperback: “a moving account of one woman’s brave journey as she confronts her mother’s past in the cold reality of the present. 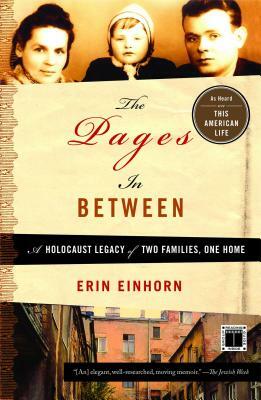 Einhorn has written a unique holocaust story—part testimony and part detective story” (Martin Lemelman, author of Mendel’s Daughter). First aired as a segment of This American Life entitled “Settling the Score,” The Pages in Between is the moving story of Einhorn’s personal journey of reconciliation and discovery in modern-day Poland. Frustrated by her mother’s refusal to talk about her tragic and unusual childhood, Einhorn traveled to Poland to find the family that safeguarded her from the Nazis as an infant. What she uncovered was the legacy left behind by a sixtyyear- old promise made by her grandfather: to give the family that harbored her mother during the war everything he had—most importantly the deed to his own family’s house. In her attempt to fulfill that debt that saved her mother’s life, Einhorn comes face to face with the realities of present day Poland, where a dispute of this kind requires endless digging through painful and often hidden history. Along the way, she suffers her own personal losses and begins to question how much of the future should be jeopardized in order to right the wrongs of the past. Part family history, part personal and present coming of age memoir, The Pages in Between powerfully tells of a young woman’s quest for the “truth” about her mother’s life, and of learning the lesson that this truth might be impossible to find. Erin Einhorn has been a reporter for the Daily News (New York), where she covered New York City government and education-related issues. She has also written for The Philadelphia Inquirer and Fortune.